Summer hits Tenerife big time with temperatures soaring (but not excessively), Spanish mainlanders filling the streets (in some places) and open air concerts and fiestas galore. For the next couple of months, the Canarios concentrate on really enjoying life outdoors. Best thing to do is to join in. It’s the time of year for Tenerife’s fishermen to cut loose and party. The serious part of the Virgen del Carmen fiestas involves carrying her through the streets and onto a waiting boat for an annual cruise. The fun part is the music, games and usually sea themed frolics (pole sliding is particularly good) that go along with the celebrations. Puerto de la Cruz (15th) is the place to be as the Dia de la Embarcación forms part of the town’s fiestas patronales which last from 1 to 20 July. There’s partying the whole day before the ‘Virgen’ goes on her little trip late afternoon/early evening. The Sardinada the previous night is also good fun, if you like lashings of wine, sardines and lively Latino bands. Like Puerto de la Cruz, Candelaria celebrates for the whole month with processions, sports events, concerts, fiesta queen galas etc. 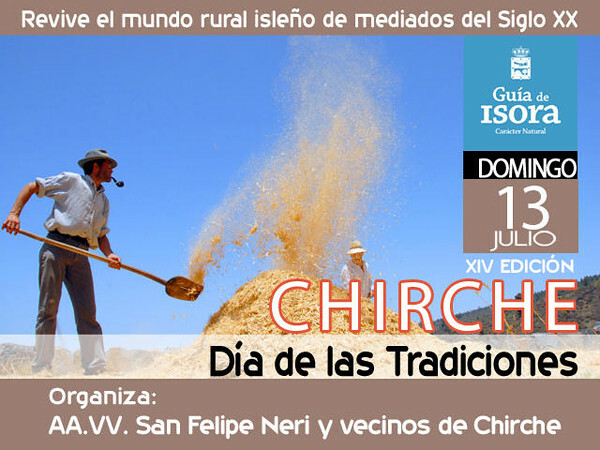 Step back in time 50 years in Chirche (Guia de Isora) on the 13th when life in the town returns to the way it was before tourism changed their world. Houses are decked out the way they would have been decades ago when life in Tenerife’s hills revolved around agriculture. There are demonstrations of the ‘old ways’ from 10.30am. 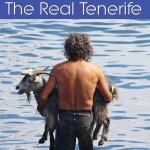 A favourite of ours and more Tenerife time travelling; a small and simple affair where horses and oxen thresh wheat, people sing and everyone wears a straw hat. Also usually good for picking up local cheeses and breads. San José de los Llanos in El Tanque at the end of the month. There’s no date confirmed yet but it’s usually the last Saturday in July. In fact one of the most recent entries on the town council website is for an artisan fair… that took place in 2012. Time travelling is clearly common in El Tanque. One of the biggest romerias on Tenerife takes place in La Laguna on the second Sunday of July (13th this year). It’s smoochy jazz time at the Auditorium with veteran American crooner Al Jarreau who’s ‘moonlighting’ in Tenerife’s capital for one night only this month. The festival for those who like classical music and movie soundtracks. Every year Fimucité has a theme, this year it is quarter of a century of music from TV series. Favourite tunes will include Batman and… err… The Borgias. There’s also a Fimucité event at the Auditorio in Los Cristianos on 5 July when the Big Band de Canarias will be performing film noir classics (8.30pm, €5). Three nights of very diverse music. The Mar festival kicks off with Celia Cruz (the Musical) and ends with a tribute to Woodstock featuring the music of Joe Cocker, Santana, Janis Joplin, Credence Clearwater Revival and Deep Purple. At first I thought it was Celine Dion on the poster but, phew, it isn’t. 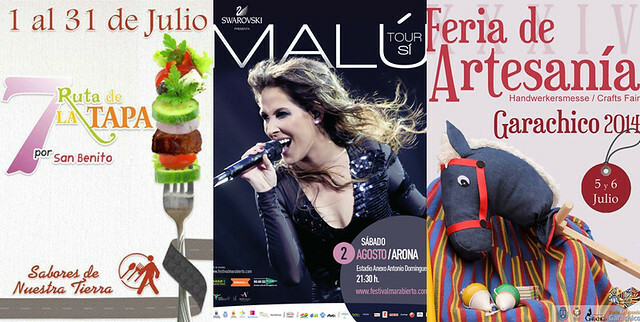 It’s top Spanish pop singer Malú on Tenerife as part of her ‘Si’ tour. I can really see her name pulling visiting punters away from the Rod Stewart sound-alikes in Las Américas. Locals. However, will flock to see her. (I know it’s August but think of this as a heads up). Better known to non Swedish as Pippi Longstocking, a musical for the children in one of Tenerife’s UNESCO World Heritage Sites. Nat King Cole’s youngest brother plays La Laguna as part of the XXIII Canarias Jazz y Más Festival. There are various concerts as part of the annual Jazz Festival but look out for the two free concerts outside the Auditorium in Santa Cruz from 8.30pm on 16 and 17 July. Both feature three bands. Sansofé normally takes place between July and August and involves a mix of traditional, contemporary and world music events as well as lots of other interesting activities. However, the local council hasn’t posted details on their website yet. Information is scant but basically it’s an opportunity to pick up some goodies at knock down prices with music and other events added on for fun. 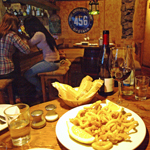 Explore La Orotava and enjoy tapas whilst you do. 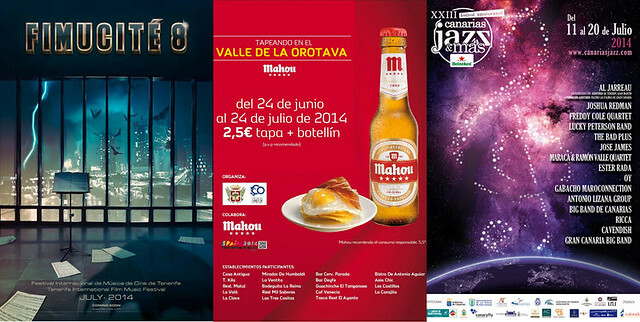 Nearly 2 establishments are offering tapas and a bottle of Mahou beer for €2.50 until 24 July. Part triathlon, part assault course, part Fear Factor. InfinityXtreme is a gruelling test of stamina for those who take part and loads of fun to watch for those who don’t. Enjoy one of Tenerife’s most picturesque towns and pick up some unique handmade crafts at the same time. 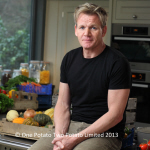 The king of Tenerife tapas routes? There are ninety bars and restaurants participating. If you eat at three a day all through July, you can get around them all and still have a day’s rest. It’s €3 for a taps and a drink. Another municipality with a gastronomic route in June that hasn’t yet finalised the details of prices and participating establishments is Granadilla de Abona. This ones has a blue fish theme (tuna, mackerel, sardines etc.) Welcome to last minute Tenerife. An excellent article. Never seen some of these. One great fiesta which has been missed, however, is the one held leading up to 25th July in Santiago del Teide for the Feast of St James. I always go when I’m in Tenerife at that time of the year and there are usually a few days of lively, quality entertainment. Give it a try! Thanks for that tip Mike. In truth, there are a few fiestas which we haven’t included – due to the fact that there are so many fiestas on Tenerife every month – so many, many thanks for adding that one. 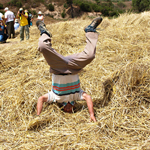 I think the Dia de la Trilla is on 27th July this year in El Tanque. I went in 2011 and personally wouldn’t be in any rush to return – whilst it is a good event, I was appalled at the treatment of the animals. There’s a great fiesta starting in Tamaimo (near Los Gigantes) on Friday 25th July to celebrate the Feast of St Anne. There’ll be processions, fireworks, Latin bands, Canarian dancing and popstars K-Narias. See http://www.losdelcuartodelasalmendras.com for details.